Gumpoen Garden (群芳園) is one of the Japanese style garden located in Yoshino, Nara Prefecture. It is considered as one of the 3 major gardens in Nara prefecture. It was built in the late Muromachi period (late 16th century). It is a typical pond surrounding style garden. In falls, it has beautiful autumn leaves. 0. at Kashihara Jingumae Station. 1. use Kintetsu Yoshino Line to Yoshino Station. 2. use Ropeway to the Yoshino. The garden of Chikurinin Temple is called Gumpoen. It was built in the late Muromachi Period. The 21st priest of Chikurinin Temple built this garden. In 1594, Toyotomi Hideyoshi visited Yoshino for cherry blossom. 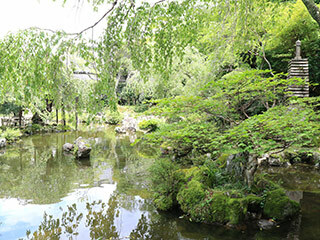 When he visited Yoshino, famous tea master Sen no Rikyu changed this garden as the Momoyama style garden. Also, Hosokawa Yusai designed this garden as well. It is a typical pond surrounding the garden.